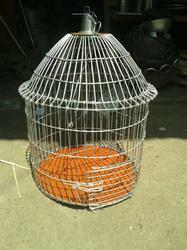 The handcrafted silver polished cage with a parrot inside is a delight to your drawing room. A very beautiful design very neatly crafted and finished with a coloured parrot inside the cage. Model No : 813 Size : 52X41.5X61.5 cms 2 cages in one carton Box. Usage: Designed to house birds as pets. - Crafted from Iron with fascinating metalwork, excellent durability. - Hollow out Design, brings an enchanting glow into the surroundings. - Nice decoration accessories for home, party, wedding or events. All Variety of cages available under one roof.